The Race the Ridge Stage Race presented by Local Ride Bike Shop in Maple Ridge, BC, is confirmed for May 1-2, 2010 and is set to be the best edition in the race’s eight-year history. Registration is now open for the challenging three-stage race will showcase the diversity and beauty of the Maple Ridge area, while offering exciting, high-speed, and spectator-friendly cycling events. Also new to the Race the Ridge repertoire is a youth stage race. “We’re adding a U17 stage race for girls and boys aged 10 to 17. This is a real stage race for kids,” said Lyster. In addition, younger children will have the opportunity to race for free at a kid’s competition in downtown Maple Ridge on May 2, during the criterium races. The action-packed weekend starts off on May 1 with the hilly Thorn Hill road race. Riders will use strategy, smarts, and pure strength as they vie for the win over multiple laps of this demanding 10km course. Later that same day, competitors will face off against the stop watch for stage two, the individual time trial. The rolling out-and-back loop in scenic Golden Ears Provincial Park covers 23km total, but riders won’t have time to check out the surroundings. Racers will have their heads down and 'pain faces' on as they push themselves to the max in an effort to log the quickest time. This route is still pending approval. 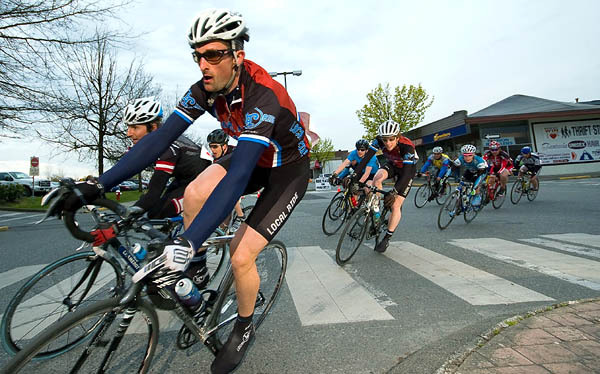 After a good night’s sleep, racers will descend upon downtown Maple Ridge on May 2 for the city’s signature sporting event of the year - Race the Ridge’s new and improved Town Core Criterium. This fast-paced, aggressive race will see riders taking risks in order to come out on top in this multiple lap race. “With three fantastic races combined with the new provincial category structure and a 75-rider limit on each field, we expect races to sell out quickly,” said Lyster. Along with high-quality races, $5,000 in cash and prizes are up for grabs. Registration for the grueling stage race is now open online at www.karelo.com and riders who register by February 28 will benefit from the early-bird discount rate.